I was surprised to discover the Feb. 4th passing of Russian composer Vyacheslav Ovchinnikov who scored many films in his native country with the 1966 epic rendering of Tolstoy's WAR AND PEACE being the most famous (winning the Oscar for best foreign film in 1968/69) and (according to Scott Bettencourt's research) was on the Academy's short list for best original score as well. If anyone finds a better link to information about this, please post it. He has his own website http://vyacheslavovchinnikov.ru/en/ which seems to have not been updated since his passing. I had no idea that he had passed away. While I'm not extremely familiar with his work, I do love his scores for War and Peace and Andrei Rublev. Only a single LP of the WAR AND PEACE score, with 34 minutes of music, was released in the U.S. and UK. Japan got a 2-LP set. I was listening to his music for the first time just the other day (from a recently obtained single LP of WAR AND PEACE - see above) and was simply doing a little internet research on the guy. His obituaries are not plentiful (at least in English) and so I kind of stumbled onto the info. I guess he was more known in classical music circles - or maybe just Russian classical music circles. 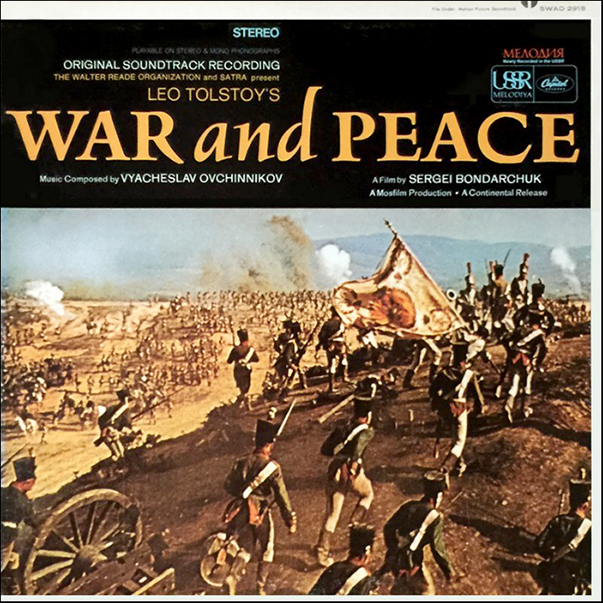 The WAR AND PEACE score sounds like a classical Russian opera - it was an immense work and the LP represents just a fragment of the large quantity of music written for the 8 hour film. His music is well worth seeking out. Criterion have announced that they're releasing the full version of War And Peace on Blu-ray (no release date yet), it's a new Russian 2K restoration. I wonder who owns the album rights? I see it's been released by Jay Productions Ltd (CD) & Melodiya/Capitol & That's Entertainment, maybe it'll get another release now. Criterion haven’t really announced anything regarding War and Peace yet, though Janus Films will be touring the film later this month so a Criterion edition is all but guaranteed. I wonder if they were able to get Ovchinnikov to contribute anything before his passing. The original soundtrack album of his War and Peace score was quite disappointing and had some cues drastically shortened. There’s a recording of a concert suite floating around on YouTube that’s a much better representation of the score. JSDouglas, if you’re interested in further delving into Ovchinnikov’s work, this YouTube video contains about an hour’s worth of music from his score for Tarkovsky’s Andrei Rublev (though I can’t answer to the legitimacy of its source). The final cue of the score is especially stunning. Thanks for the info, Tack. The album also has sound effects that take over on certain tracks which is regrettable. The editing, as you mention, leaves a lot to be desired. It would be nice to see a re-issue that addresses those problems. Here is the reissue trailer. It's a shame that Mosfilm could only afford to do a 2K scan of this 70mm film. Well, that's socialism for you. Actually, if the film's ratio (i.e., 2.40:1) as shown in the trailer is any indication, it appears as if they scanned 35mm materials. I read one report that said that the 70mm negative is located in the Ukraine. Apparently, Russia has been unable to march far enough to capture it.